Description: Our train has just arrived and we shot pictures of it at 11:29 A.M. We couldn't have asked for a better crew today. Seeing so many Massachusetts Bay Transit Authority trains really was a treat. Description: 1135 pushing train 354. Description: MBTA 1135 pulls out of Wilmington with train 323 heading to Lowell. Description: Outbound 091 gets pulled by, recently layed over from the North side, GP40MC 1135. Description: GP40MC 1135 provides the power for 048 heading into Boston. Description: GP40MC 1135 shoves 043 into Boston departing South Weymouth. Description: Outbound 049 pulls into South Weymouth with 1135 leading. Description: GP40MC 1135 pulls 049 out of South Weymouth. Description: GP40MC 1135 pushes 052 across Randolph St. Description: MBTA outbound arrives in Fitchburg station led by 1135. 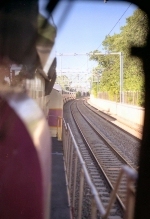 Description: MBTA cab car 1649 waits to lead a commuter train back to Boston from Fitchburg. 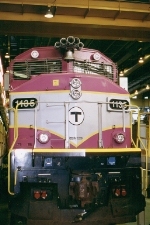 Description: MBTA 1135 idles in Fitchburg prior to its scheduled departure back to Boston.